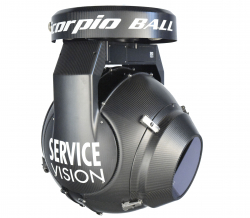 The Scorpio Ball head is a new generation of Scorpio products. Its full digital technology and customized Gyro Stabilizers make this head the one that allows mounting all different HD cameras with both fix or zoom lenses with accurate stabilization and almost zero drift. The development of HD slip rings allows 360º PAN axis movement with unlimited turns with HD signal. The lightweight, small size and quality of stabilization, make this head the best option to be used with camera car, cable systems, travellings, helicopters, etc... even in feature films or television events. The Scorpio Ball head can be mounted under slung or over slung through two different mounts: Mitchell mount and Cone mount for helicopter supports. There is also available a Vibration Isolator for the union between the support and the head if necessary. The Scorpio Ball head can be controlled by the standard Scorpio controls: Handwheels, Hand Held, Joystick or Pan Bar.